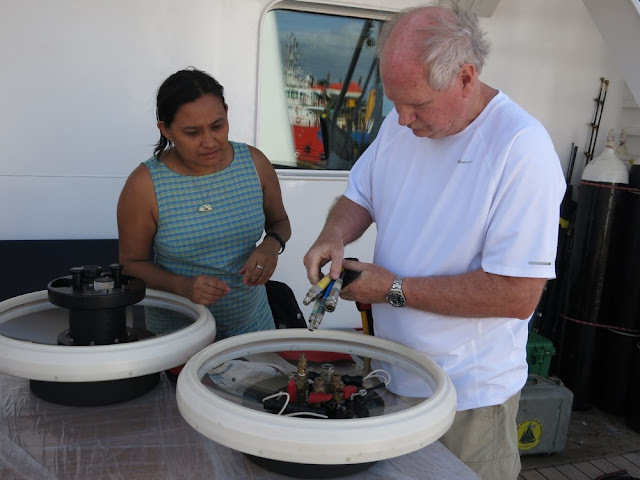 Aquarium researchers and staff are on expedition to the remote Phoenix Islands Protected Area (PIPA) to study the natural history of the islands, surrounding reefs and connecting open water ecosystems. Research on the 2015 expedition will directly inform the management and maintenance of this world-renowned MPA. Today's post comes from the expedition's chief scientist, Dr. Randi Rotjan. Before sailing off to the middle of nowhere, it is wise and prudent to check that all gear has arrived as expected. In doing so, our team discovered a few missing items, which are near impossible to source or replace in Apia. In moments like these, we all wish for time travel: if only I could go back a few days and get the part and bring it with me...if only I could stop time so that someone could fly the part here from home. Typical wishful thinking! In our case, we noticed that the oxygen analyzer was missing. An oxygen analyzer is a critical part of a hyperbaric chamber. (Yes, we are bringing a hyperbaric chamber onboard with us. It's a must, when the nearest chamber is over 5 days away!!) 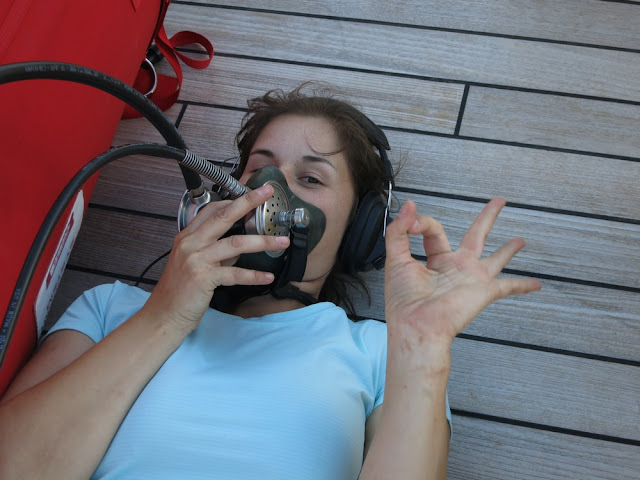 The analyzer determines oxygen levels in the chamber, to make sure that an injured diver receives as much oxygen as possible without hitting toxic levels. This is especially important, since oxygen concentration is a moving target. Each person has a different physiology that is constantly changing. Oxygen concentration is related to flow, breathing rate, absorption rate... quite a lot of factors. So, without an oxygen analyzer, there is no way to effectively monitor oxygen levels. Long story short, however, there was some scrambling, some crazy moments, but after a lot of dedicated effort, miracles happened and we found an analyzer!! Only 20 miles away! No big deal! 20 miles, pfft! Easy peasy! Unless...20 miles is in another country and across the dateline. Yep, a few years ago the international dateline was moved so that now Samoa and American Samoa are a whole day away. Luckily, we have a resourceful team member who made the time travel leap and flew into yesterday, to retrieve the oxygen analyzer to bring it back into tomorrow. Talk about back to the future! Take a look at the dateline in the central Pacific. For those who dream of time travel, this is the best spot on the globe to play with the concept. But most importantly, all of that time travel has enabled what is going to happen TODAY: the ship will set sail, north, to PIPA. But en route, the ship will likely cross the dateline a few times. First, into yesterday. Then, back into tomorrow. Then, back into yesterday. Of course, all the while staying today for those onboard.